Can you believe it? A year ago we were in this church watching the first tentative steps along the Downend Folk Club road. A whole year! Over those twelve months Ant, and his gang of Merrie Folksters, have established one of the finest folk clubs in the South West. We have been treated to rising stars and folk super heroes, wonderful musicians and beautiful singers, storytellers and raconteurs. How fitting that all of these things collided on the first birthday. By the end of the night there would be foot stomping, full throated roars of approval and much drunken weaving between the pews. 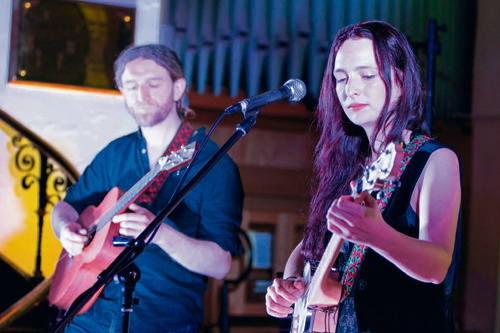 Somehow you knew that it was going to be a good night when the support act, Kirsty Bromley, wondered “so, are you a singing audience, or a listening audience?” The noise from the congregation was a joyous buzz and hum, a true multi-voiced folk singing. Mind you Bromley has a voice that makes you want to sing. It’s crystal clear and note perfect. Impressively she doesn’t bother with any of this new fangled instrumentation nonsense. She’s sings a cappella, holding notes and audience in the palm of her hand. She could have sung her songs all night and not one person in the packed house would have complained one jot. Except, of course, they would have missed out on the extraordinary Phillip Henry and Hannah Martin, yet another BBC Folk Award winning act to grace this stage. She sings and plays banjo and fiddle. He sings and plays a dobro. Oh, and a harmonica. Now the harmonica is not your traditional folk instrument nor do you hear the words “How does he do that?” very often when someone teases some sort of Dylan-esque wheeze from that little contraption. Phillip Henry makes magic with his. It replaces an accordion sometimes, a bass at others and then it whooshes from the back of the altar like a freight train. In the main their songs have a fragile, fractured feel to them. Many are so delicate that you could almost blow them away. The only thing that holds them together is a virtuosic musicianship and an ear for a damn good story. “Miss Wilmott’s Ghost”, “Song For Caroline Herschel” and “The Painter” all have strong women at their centre if not much of a sing-along chorus. Those arrive a bit later as the set really hits its stride. A new song introduced as “Our Happy One” catches fire with Henry beat-boxing through his harmonica (“How does he do that?”) and Martin dragging a dance from her fiddle. The tempo doesn’t let up and by the end of the set a tremendous cover of the traditional “The Boy Who Wouldn’t Hoe Corn” leads to a frenzy of whooping and stomping. After the foot-stomping and fiddle whirling Henry and Martin unplug their instruments and step to the front of the stage. A delicate, lullaby version of James Taylor’s beautiful “Close Your Eyes” silences the church. The hush spreads and drifts, those massed humming folk voices are heard again as we all sing our way into the second year of the Folk Club’s life. It is a very special thing. Frenchay Village Hall. Friday May. 15. Doors open 7.30pm. When a singer draws praise from folk royalty such as Nic Jones, John Tams and Kate Rusby, you can be sure they have something very special. The subject of this praise is Ruth Notman, who headlines Downend Folk Club’s May event. Ruth is a contemporary folk singer/songwriter based in South Yorkshire, who has been maturing and honing her style and skill for over a decade in front of festival and venue audiences all over the UK. After a musical sabbatical to concentrate on studies, Ruth is returning with more style than ever and is currently preparing to record her new album, six years after her last record “The Life of Lilly”. Ruth’s debut album “Threads” came out in November 2007 and really did, to quote BBC Radio 3’s Verity Sharp, “cause quite a stir”. Rarely has a young folk artist’s first album had such a huge impact on what is sometimes a difficult genre to please. But it did more than please the folk fraternity. It went on to receive plaudits in major nationals including The Independent (album of the week), The Guardian and MoJo. Ruth played live in session on Radio 2 with Bob Harris, who loved the album and Ruth’s live set. Opening the evening will be Jimmy Aldridge and Sid Goldsmith, who are themselves forging a superb reputation on the UK folk scene. Jimmy and Sid play traditional and original folksong of the British Isles. They tell stories of hardship, joy, struggle and celebration held together with driving banjo and guitar arrangements and close vocal harmonies. The event will be held at Frenchay Village Hall on Friday 15th May 15. Doors open at 7.30pm and there will be a full bar serving GWB real ale, cider, wine and a range of soft drinks, as well as a raffle. Tickets are £8 in advance, £10 on the door and are available from Melanie’s Kitchen, Kafe Karma, Bristol Ticket Shop and www.downendfolkclub.co.uk. Members tickets are £7 from the website or direct from Ant Miles.